Located on a headland to the north of Fraserburgh, Aberdeenshire, the Kinnaird Head Castle Lighthouse became operational in December, 1787. 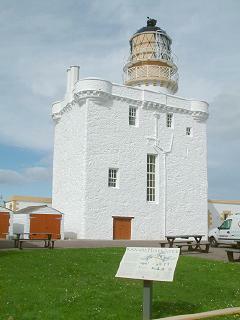 Constructed by Thomas Smith (1752 - 1815) for the Board of Northern Lighthouses, its first in Scotland, the lighthouse was created from the existing 16th-century Kinnaird Castle, which had been a Fraser ancestral home. The castle was built overlooking the harbour in Fraserburgh, the power-base of the Frasers of Philorth, to a simple rectangular plan and of four storeys. Alexander Fraser, the 8th Laird, took a great interest in the Northern Lighthouse Board, established in 1786. The following year, concerned about safety at sea, he gifted his castle to the Board to be converted into a lighthouse and it was operational by the end of that year. It was the only occasion that the Board made use of an existing building in constructing a lighthouse. The 'Lighthouse Stevenson' Dynasty also had their part to play at Kinnaird Head. Robert Stevenson (1772 - 1850), grandfather of author Robert Louis Stevenson, reconstructed the station in 1824. His son, Alan Stevenson (1807 - 1865), improved the light and built the first lighthouse keepers' cottages (1851). David A. Stevenson (1854 - 1938) continued the tradition by installing a new lens assembly and developing the cottages (1907) that we see today. A pneumatic foghorn was built in 1903 to provide an alternative warning signal in time of low visibility and the first radio beacon in Scotland was constructed here in 1929. Minor repairs to the building were necessary when German bombs dropped close to the lighthouse in 1941. The foghorn was decommissioned in 1987 and the lighthouse followed in 1991, with a new automatic light constructed nearby. The old lighthouse now forms the major part of the Museum of Scottish Lighthouses. In 2004, the Northern Lighthouse Board announced its intention to restore the old lighthouse to operational use because of its superior light.